BlackBerry KEYone, the much popular phone with the codename 'Mercury' was recently launched in India for INR 39,990. 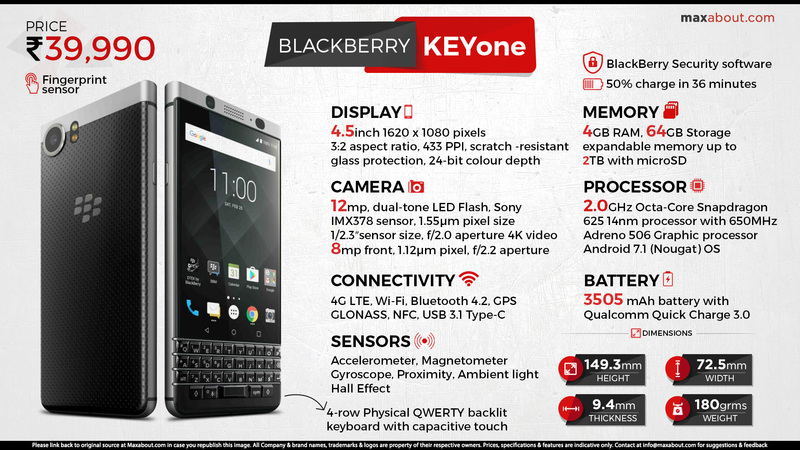 Being the last phone that is to be made by BlackBerry, KEYone is a special model for sure. It comes with a 4.5 inch touchscreen with 1620 x 1080 pixel resolution and comes with 3:2 aspect ratio. The special part comes with its physical keyboard with 4-row QWERTY layout. The same responds to touch gestures and allow flick typing while a fingerprint sensor is built into the space bar. It is built over an anodized aluminum frame and runs on Android 7.0 with security as well as productivity suite from BlackBerry. The back section of KEYone is finished in soft touch materials while it weighs quite high at 180 grams. It is powered by 2GHz Octa Core Snapdragon 625 processor, 4GB of RAM and 64 GB internal storage. The 3505 mAh battery on the KEYone supports fast charging and claims up to 50 percent battery in just 36 minutes. BlackBerry KEYone uses a 12 MP rear camera with dual LED flash, PDAF and 4K recording while the front is 8 MP unit with 1.12 um pixel size. It comes with a 3.5 mm audio jack, 9.4 mm of minimum thickness and USB Type-C connector. The phone supports LTE and NFC for enhanced connectivity.